Basements are substructures or foundations of a building or home. It is the lowest habitable story and is usually entirely or partially below ground level. They typically have ceiling heights of 8' and are often finished off as living or storage space as needed by the homeowner. 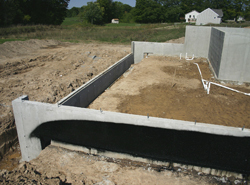 House plans with basement foundations can’t easily be built in certain regions of the country where the water table is high. But, they are usually the preferred foundation in the Midwest or Northern parts of the country as opposed to the Coastal areas or Lowcountry regions that have a high water table. Basements that have a door accessing the outdoors will pass local and national fire codes and can safely include sleeping areas. The Chamblee Craftsman Home has 3 bedrooms, 2 full baths and 1 half bath. 2795 Sq. Ft., Width 78'-0", Depth 62'-6"
Our house plans with basements collection includes many different styles of home designs and offer detailed floor plans that allow the buyer to visualize the look of the entire house, down to the smallest detail. With a wide variety of plans, we are sure that you will find the perfect house plan to fit your needs and style.